In the history of air warfare few missions come close in terms of courage and the highest skills of precision flying to the one carried out by 617 Squadron on the night of 16/17 May 1943. 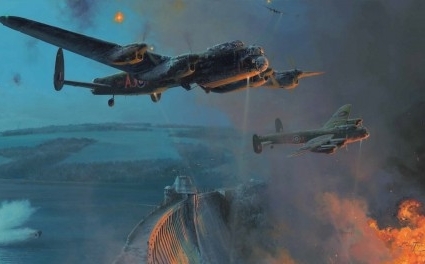 Codenamed Operation Chastise, their mission was to destroy the great dams that were vital to the industries of the Ruhr and, to do so, they would use a radical new weapon designed by Barnes Wallis – a ‘bouncing bomb’ that would ‘skip’ across the water before detonating against the dam wall. On the night of 16 May, after seven weeks of intensive low level training, nineteen crews flew their Lancaster Bombers from RAF Scampton to carry out what became one of the most legendary missions of all time. The result was the destruction of the Möhne and Eder dams. 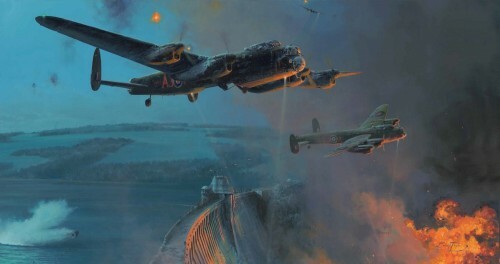 Robert Taylor’s painting depicts a moment at the height of the successful attack on the Möhne Dam, the first of three primary targets that night, as ‘Dinghy’ Young powers Lancaster AJ-A over the wall of the dam just after releasing his bouncing bomb. Commanding Officer Guy Gibson, flying high with lights on to draw enemy flak, noted that Young’s bomb made “three good bounces” before successfully detonating against the dam wall to trigger its collapse. David Maltby in AJ-J will shortly deliver the final, decisive blow. Bomb-aimer on Lancaster AJ-T that attacked the Sorpe Dam, scoring a direct hit. The R/T Operator at RAF Scampton throughout the raid constantly communicating with the crews. The daughter of Sir Barnes Wallis who, as a child, helped inspire her father to develop the Bouncing Bomb. Rear Gunner on Lancaster AJ-F which attacked the Sorpe Dam despite heavy flak en route. Front Gunner on Lancaster AJ-N which attacked, and successfully breached, the Eder Dam. The Flight Engineer on Lancaster AJ-N that successfully breached the Eder Dam.